Koraishunti also known as Matorshunti means green peas and Notun alu or new potatoes both are winter specialty, so this combo meal of green peas stuffed small Indian fried flat bread with new potato curry is a seasonal delicacy. Every Bengali household at least once will make these when green peas are abundant and these small tiny cute potatoes appear in the market after the harvest. Like the availability of fresh green peas in Bangalore, winter in Kolkata is a rare commodity. The mercury never falls below 10 but Romantic Calcuttans love to clad themselves in courful heavy woolens and enjoy every bit of it by visiting the annual book fair or by arranging picnics. No Bengali can think of celebrating the inception of winter without this fried meal. Folowing this tradition I also make it every winter atleast once whenever we get fresh peas in the market. I won’t blabber much today as am going to share 2 recipes in one post so all my stories are shelved for some future post. Mix in all the dry ingredients for the dough. Make a well in the center and pour the oil. With your finger tips mix it. Add in water a little at a time to make a soft but firm dough. Knead it for 5 minutes, cover and keep aside. Now grind the green peas. Mix the ginger paste and cumin powder with 1 tbsp water. Heat the oil and add in the masala paste. Fry till oil separates at the sides, add the ground peas and salt. Fry on low heat till all masala gets mixed to the peas. Stir continuously to prevent it from sticking at the bottom. Once the mixture becomes dry add the bhaja masala, mix in and let it cool. Now take small balls from the dough, size of a small lemon. Stuff with the cooked peas and seal by pressing with your finger (Make sure air is not trapped in the ball or they will break while frying) and roll between your palm to form a neat ball. Roll out each ball into small circle as puris. Heat oil in a heavy bottomed deep pan. The heat of the oil is very important for this. To check whether the oil is ready dip a corner of the rolled kochuri in the oil, if it sizzle then the oil is prepared for frying. Increase or decrease the flame to control the heat. Put the kochuris one by one and fry them with a slotted spatula. 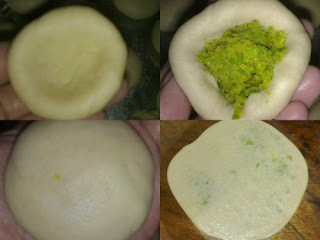 To puff it up lightly press the middle of the kachori with the spatula. Fry till golden on both sides. Drain on absorbent paper. Though I made it with small potatoes but this could also be done with any potato. Peel and cut them in cubes and you are ready to cook. Boil or microwave the potatoes skin on, with salt for 7-8 mites. Cool and peel. In the meantime make a paste with the onion and ginger. Beat the curd and keep aside. Smear the potatoes with a pinch of turmeric and salt. Heat 1 tbsp oil and lightly fry these on low till a crisp coating is formed. Drain. Heat the rest of the oil and temper with the whole garam masala. Once it gives off the aroma add in the spice paste and fry till oil separates. Add the turmeric, chilli and coriander powder and fry for a minute. Pour in the chopped tomato and salt; give a good stir and cover to cook for another couple of minutes. Once the tomatoes are soft add the beaten curd and fry to mix everything together. Tip in the fried potatoes and mix to cover them with the spice mix. Add a cup of water and sugar, cover and simmer till the potatoes are soft and the gravy coats them nicely. Sprinkle the garam masala powder and serve with the kochuris or parathas. I also made some spicy cholar daal (Bengal gram) another legendary accompaniment to Kachuris, for Hubby. Apart from forming our dinner tonight this plate is also off to the beautiful event ‘Combo Meal’ started by Pari of Foodilicious. Wow!!!! That is a wonderful looking meal!! Delicious, I want some. I am cooking the Alu'r Dom very very soon. OMG!!!!! 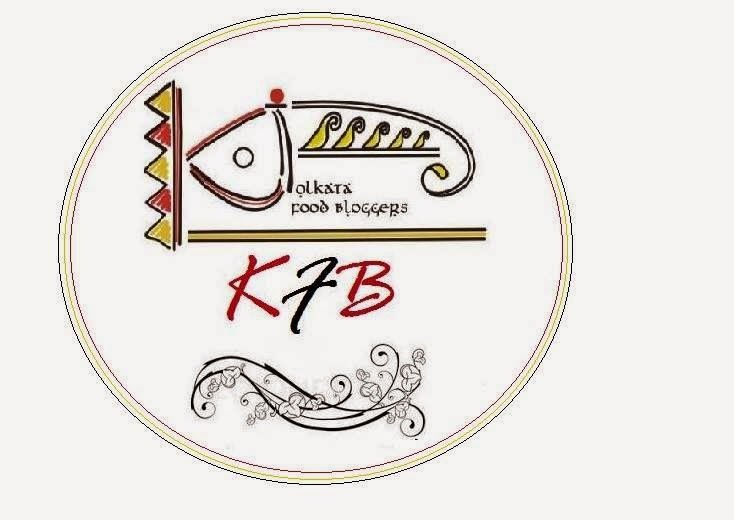 !cant take my eyes from those beautiful dishes, wat a work dear, stuffed peas kachori looks incredible and that tempting alu'r dom makes me hungry...yea am gonna try soon too..
Bideshe bos-e ki turture korchho tumi!!! Banabo phire giye...book mark korlam.. Wow!!!!!!!!!! !tempting and mouthwatering dishes...love the colour and yummy..must try 2morrow!! Sayantani, I am drooling over your pictures!! 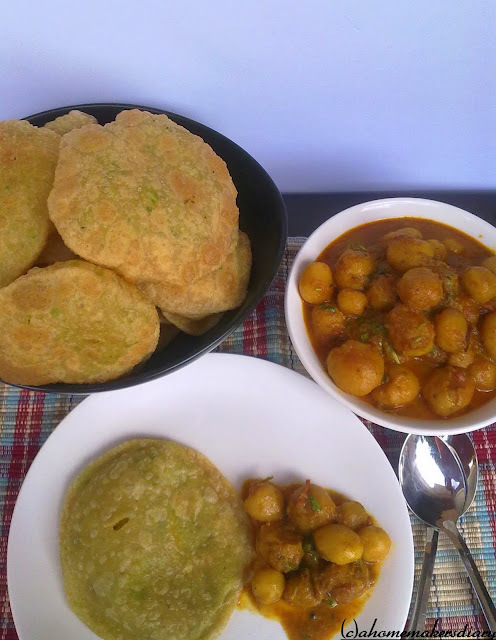 Kachori and dum aalo both look so delicious and mouth-watering.. yumm, perfect combo indeed! @Asha, yes this is indeed a fascinating meal and even Hubby who does not like fried stuffs much loves to dine on this. @Priya, Thanks and I liked your onion kochuris thats next in my kitchen. @Ushnishada, ema sotti baire aka thakle barir khabar aar specially ei sab nijeder khabar sabai khub miss kore. tomra barang ak kaj karo deshe fire tumi boudi ke nie amar bari chole eso. khub bhalo lagbe. anek adda aar amader purono bangla khabar. tabe anek dhanyabad tomar bhalo laglo jene. etai chai je amar chele bhaijhi jano amar ei recipes gulo dekhe ma thakuma'r purono rannar swad khunje pay. @Jagruti, before saying thanks let me tell that you have an amazing place. gorgeous pics and great recipes. ow how an amazing cook you are. 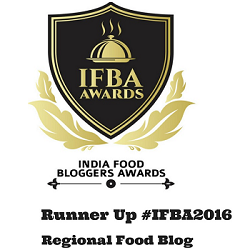 @Somoo, it seems MIL has taken over the kitchen and you all are so busy to eat the great food that you are giving the blog a miss. @PJ, its tasty but calorie laden. Sayantani, simply Bangali khabar-ta dekhe icche korche khete. Kochuri ar alur-dam is one of the favourite items in winter in our home. Thanks for sharing. Lovely pictures. wow..what a lovely dish..love the kachoris and potato bhaji...lovely clicks.. I'd finish the entire spread :) love Bengali preparations, great combo too! Looks delicious..ummmm I will have to make some kochuri soon.. loved it! Sayantani we just enjoyed this combo meal for dinner! It is delicious! @Gouridi, Thanks for visiting me. @Indrani, sorry go! tabe bhalo rannar chobi dekhle kintu energy paoya jay chatpat kichu karar. ami roj dupure bose bose dekhi aar enthu pai chele samle kichu bhalo bananor. 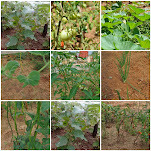 @Deepa, chitra, Suparna, welcome to my page. hope you liked your visit and thanks for your appreciations. @Anjali, glad that you enjoyed. isnt it a must make for winter? Wow Your aloo dom is so tempting.Looks awesome .I have bookmarked this page to try. very lovely sayantani....very nice...aloo dum looks tempting..
Kochuri with alur dom is my favourite dish. I appreciate for your wonderful presentation. The pictures looks so tempting and mouth watering that I feel like having it now. Hey I must make this for S somtime, looks so tempting.Thanks for sending it to my event, just one request here, pls put the logo as that's a compulsory thing. I use hing in the filling too. Everything looks extremely perfect and delectable. amar monay hochey thala niye boshe pori ebar. awesome! clicks make me drool! glad to follow u!! Wow, delicious, I have bookmarked! 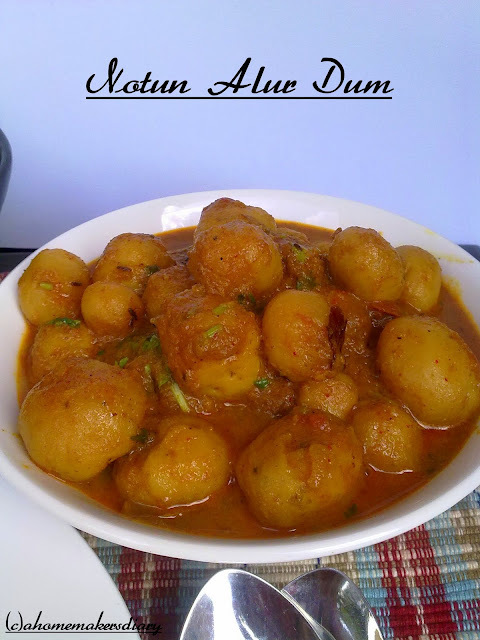 Wow Sayantani, Thanks for sharing aaloo domer recipe. I have been looking for this Bengali style recipe for really long, but couldn't find anything which satisfied me. I tried your recipe and loved loved loved it!!! !